Floyd Mayweather is one hell of a boxer who is not afraid to flaunt his wealth anytime opportunity presents itself. 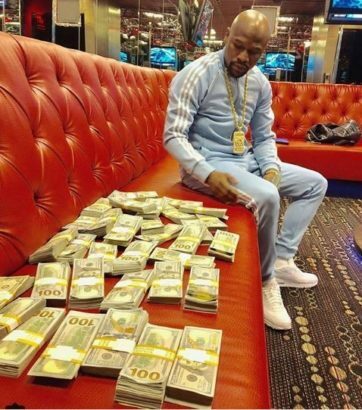 Mayweather is one of the richest sportsmen in the world.Floyd Mayweather Jr is an American boxing champion who is regarded as one of the best pound-for-pound fighters of his generation. He has major world titles in his belt including WBC super featherweight champion, WBC lightweight champion, WBC super lightweight champion, IBF welterweight champion, WBC welterweight.